Maui is Hawaii's second largest island, but the most visited by travelers. Maui owns one of the world's largest dormant volcanoes. Maui is also the breeding ground for rare humpback whales. 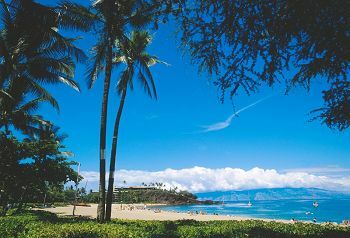 Stretching 729 square miles, Maui offers exciting adventures, shopping, eating, and fun for the whole family. Kahului doesn't offer much to the sightseer, but it is the embarkation point for Maui's sugar and pineapple crops, this town has a commercial but homey feel about it. While driving down Kaahumanu Avenue (Route 32), wander through Kanaha Pond Wildlife Sanctuary. Once a royal fish pond, it is now an important bird refuge. Also visit Maui Zoological and Botanical Gardens 243-7337. This Zoo, which is great for kids, features wild boars, feral goats, tropical birds, ostriches, ducks, geese, and monkeys. In the botanical section, one will be able to find colorful Hawaiian plants. Alexander and Baldwin Sugar Museum 871-8058 Here you can get an introduction to Hawaii's main crop, also trace the history of sugar cultivation in the islands. This museum portrays everything from early life in the cane fields to contemporary methods for producing refined sugar. Maui Tropical Plantation 244-7643 This is a 120-acre enclave with orchards and groves displaying dozens of island fruit plants. This is a bumpy, tortuous road between Kahului and Hana. Although it is such an adventure to drive, it is know as the most beautiful drive in all of Hawaii. The road has over 600 twists and turns and 56 one-lane bridges. The drive takes a total of three hours and is 51 miles to Hana. It is recommended that you take a whole day to make the drive. Many places claim the power to create memories that will last a lifetime, but few fulfill the promise like the Island of Maui. If it’s relaxation you're after, we've got it, with near-perfect weather, great places to stay, uncrowded beaches and a setting that inspires awe and a sense of wonder. If you are looking for adventure and new experiences, we've got that too. Discover Maui, where whale-filled seas meet heavenly beaches. A place where the sun warms tropical trade winds that will blow your troubles away. Snorkel in crystal-clear waters or play golf on world-class courses of green, velvet perfection. Aloha and welcome to Maui, the Magic Isle.